The San Francisco Peaks are the focal point of Flagstaff. They are also sacred to local Native American tribes as well as the hub for Flagstaff Snowbowl and Mt. Humphreys. Founded in 1894, Lowell Observatory is the home of Pluto. Enjoy guided tours of the historic campus, interactive exhibits, daily solar viewing, and nightly stargazing. The San Francisco Peaks are composed of numerous mountains with plenty of hiking trails. The Peaks are considered sacred to many of the local Native American tribes in Northern Arizona. The Peaks are also home to Arizona Snowbowl. What can I see and do at the San Francisco Peaks? The San Francisco Peaks are the most beautiful mountains that this state has to offer visitors. You can hike, camp or explore. Hike: If you like to hike you’ll have plenty of trail options on the Peaks. With roughly 30 trails to choose from on the various mountains that make up the Peaks there is something for every traveler. Elden Lookout trail: Want great views without the slog up Mt. Humphreys? Check out Mt. Elden’s Lookout Trail. You’ll get great views with less of a hike, plus it’s in town. 3 miles and strenuous. Hikers only. Fatman’s Loop: A large loop on Mt. Elden, it’s a good morning workout and it’s close to town, located just by the mall. 2 miles and easy. Hikers only. Old Caves Crater Trail: This trail will take you to the bottom of an old, dead cinder cone volcano. It is 3.5 miles northeast of the Flagstaff Mall on the East side of town. 1.2 miles and moderate. Hikers and horses welcome. O’Leary Trail: If you’re camping in the area then O’Leary Trail is a must see. Once you hike to the top you can see into Sunset Crater and the Painted Desert. It’s located by Sunset National Park. 10 miles and strenuous. Hike, bike, or horseback ride. Waterline Trail: This trail is great for wildlife encounters and all day excursions. It is about 6 miles north of Flagstaff. It’s a 6 hour trek each way. 14 miles and moderate. Hike, bike, or horseback ride. Camp: There are four designated camping areas on the Peak. Two are currently open for business. 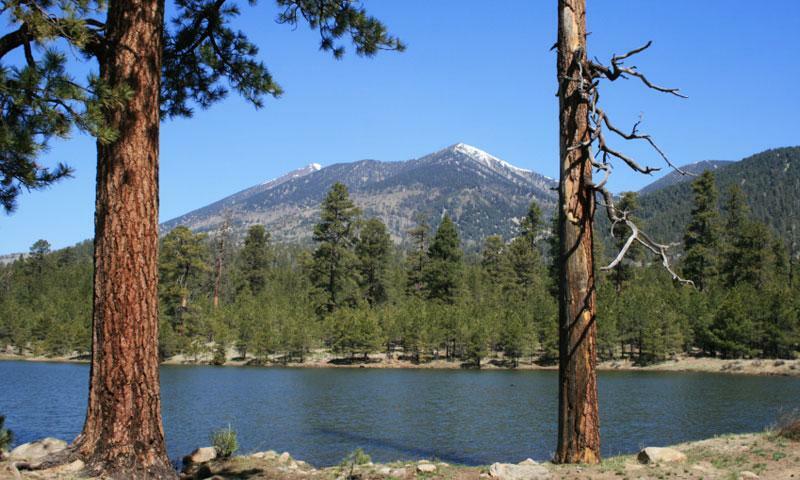 Bonito Campground: This campground is on the East side of the Peaks and is extremely close to Sunset Crater. It is $18.00 per night and open from May until mid-October. Lockett Meadow: Large open meadows encased by towering trees, this is far enough—yet close enough—to Snowbowl for comfortable camping. The campsite is just on the other side of the mountain, opposite the ski resort. It is $12.00 per night per single family (8 people or less). It is currently closed but is usually open from June through mid-October. Scenic Drives: There are four designated scenic drives. The Around the Peaks Loop lasts for 44 gorgeous miles (closed in winter). Schultz Pass Road offers 26 miles of you, the road and the changing trees (closed in winter). Snowbowl Road, a paved road that goes on for 15 miles, is a quick drive for you and your family. Volcanoes and Ruins Loop is a 70 mile drive, great for a day in the car seeing the sights. Disc golf: If you don’t want to hike—exploring the ponderosa pines—or if camping isn’t your thing, you can stop by the ski resort and play some disc golf. It’s like golf but with a Frisbee. Skiing and Snowboarding: If you visit the peaks in the winter then you can visit Snowbowl and hop onto a board—or two if skiing is your style—and play in the snow. Skyride: Wanna take it easy but still enjoy the wilderness? The Skyride lift up Mt. Humphreys from Snowbowl is the attraction calling your name. Where are the San Francisco Peaks? The peaks are all around Flagstaff. Most are located by Snowbowl and can be accessed via the ski resort. However, Mt. Elden is located in town and has several hiking trails. How much do the San Francisco Peaks cost? Hiking and scenic drives are free. Camping at the peaks has varying costs. For details contact the forest service. If you have questions you can call the Flagstaff Ranger office at (928) 526-0866. The Kachina Peaks Avalanche Center strives to provide education and safety training in the San Francisco Peaks in northern Arizona.